This vignette provides a quick snapshot of an inventing games lesson focused on net games. We can readily appreciate the diversity of students’ skill levels and also how students are the architects of their own games. To embrace human rights is to become aware that without social justice there can be no fairness or equality; consequently, democratic processes cannot function. Essential to the definition of democracy is the notion that all people have equal power to live freely, to vote, and to speak. The two things I hear from students in my physical education classes when I say we’re going to be looking at football are usually I don’t like football and I’m not good at football. Although it can be a lot of fun, football can also be confusing, and many students are quick to discount their ability. 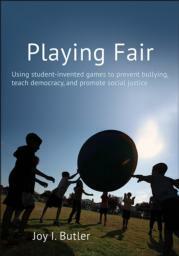 Playing Fair helps you create a learning environment in which your students can grow as problem solvers, decision makers, and team players. Theories and constructs for games help students learn skills, strategies, and concepts that apply both to other games and to other life situations. Resource for in-service physical education teachers. Reference for pre-service teachers and graduate students.